New research out of Australia suggests diets with a high amount of green vegetables and beets can significantly reduce the risk of age-related macular degeneration (AMD). Study authors believe these veggies are so beneficial for the eyes due to their high nitrate content. For their research, scientists from the Westmead Institute for Medical Research analyzed 15 years of health records for over 2,000 Australians aged 49 and older. All of this data was taken from the Blue Mountains Eye Study. Patients who ate at least 100 mgs of green, leafy veggies and/or beets every day had an almost 40 percent reduction in developing AMD. 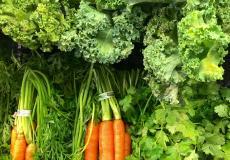 This was compared with people who ate less than 70 mgs of these veggies every day. As mentioned above, researchers believe the nitrates found in these vegetables play a key role in reducing AMD symptoms. Studies in the past have shown that when people eat veggies like spinach or beets the nitrates relax the body’s blood vessels, which helps naturally lowers blood pressure. Study authors note, however, that there was no correlation between a lower risk of late stage AMD and consumption of these veggies. Also, researchers didn’t see any additional benefits to eating over 142 mgs of nitrate-rich vegetables in terms of AMD reduction. Current estimates show that one in seven Australians now has some degree of AMD. This disease most commonly affects people over the age of 50. There are two main forms of AMD: dry and wet. The dry form of this disease is more common and adversely affects a person’s retinae. Although wet AMD is rare, it’s far more serious. Patients with wet AMD have leaky retinal blood vessels and require more intensive procedures to keep the disease at bay. Although there’s no cure for AMD, doctors can reduce visual symptoms if they catch it early. Oftentimes, AMD presents no visual symptoms until it has progressed a great deal. This is why it’s critical for patients over the age of 45 to get at least one visual screening per year. Dr. Bamini Gopinath, who works at Westmead Hospital’s Center for Vision Research, was the lead researcher on this study. A few other key study authors include Drs. Gerald Liew, Paul Mitchell, and Joshua R. Lewis.